The opening pages of the diary of Benjamin Freure (1836-42) are full of hope, as he travels from England across the Atlantic with his family to start a new life. Upon reaching the backwoods of Wellington County, his tone changes as he tackles the serious business of clearing the land, raising a barn and hauling produce to town. His son Felix, a violinist, is called out to many social events and is a “crack shot” with his rifle. One can observe their diet shift from wild game to domestic livestock over the years. Would you like to experience daily life in the 1800s? Now you can. For several years I have used rural diaries in my research on Upper Canada (the province of Ontario). These precious old documents, often fading and brittle, are scattered in various archives. Now they have been gathered together in the Rural Diary Archive for researchers to access and enjoy online. The website showcases over 130 diarists from across Ontario from 1800-1960. The full texts of selected nineteenth-century diaries are available to read, search, and transcribe and more are continuously being added. Diarists provide a wealth of detailed, regularly generated information. They document the trans-Atlantic journey, creating a home in the backwoods, hunting, and the seasonal round of agricultural production and marketing. Many rural men engaged in other non-agricultural pursuits such as logging, hunting, preaching, teaching, and fur-trading. Women made daily entries regarding the management of food resources and caring for the young, elderly and sick. The diarists lead us into the heart of the household economy, inter-generational relationships, and neighbourhood and kinship ties. You can engage the website in three ways. The MEET THE DIARISTS section provides a brief overview of each diarist. You can search this table by county, ethnicity and occupation to find diaries online or in other archives that suit your interests. The SEARCH section contains the full text of several transcribed/typed diaries to read. Try searching for the following words or your own selection and you will yield a variety of everyday contexts in which they are mentioned: pudding, quilting, oxen, swamp and medicine. The transcribed diaries of Charles Thomas of the Bathurst District (1850-52) will soon be available. Charlie, a former employee of the Hudson Bay Company, operates a stopping place on the Bonnechere River providing overnight accommodation for guests passing through, primarily lumbermen. His mother is of Cree heritage and Charlie has close ties with the local Algonquin population who help him clear land and trade fur. He struggles to secure reliable sources of food for his guests, fodder for their livestock and medicines for the local population. Severe winter weather adds to his worries as horses fall through the ice and timber rafts crash upon the rocks on Golden Lake. The TRANSCRIBE section contains the full text of several handwritten diaries which visitors can transcribe online. Once transcribed, these passages immediately become searchable too. William Sunter of Wellington County (1857) details his farming activities, love of horses, opinions about virtue and vice, and recipes for cough medicine. Appearing soon for transcribing is the diary of Hannah Owen Peters Jarvis, near Queenston (1842-45). Her scrawl is hard to read, but her dramatic story will grip your imagination. Hannah, the wife of Loyalist William Jarvis, once mingled with the elite and had servants and slaves but by the 1840s, she is reduced to poverty. She is caring for her daughter and several penniless grandchildren who reside in “Willowbank.” In this declining mansion home, which is now a heritage site, she scrubs, mends and cooks. “Society” people sometimes grace her pages. For those interested in culinary history, her cookbook is part of the archival collection. 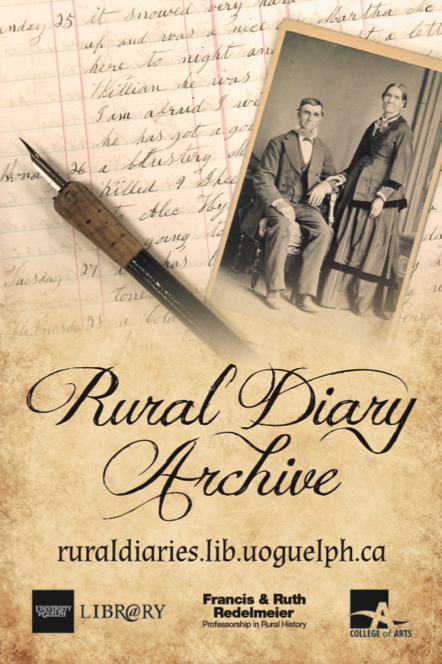 The Rural Diary Archive invites you to read your way into the past and learn more about the trials and tribulations of early settlement. Rural diarists were both witnesses and subjects as they recorded events within their household and community. Each entry reflected that day’s mixed flow of undifferentiated activities: it started with the weather, then proceeded to the day’s business which might involve a trip to town, picking berries or negotiating the exchange of man-days over a cup of tea, and often concluded with some personal or religious reflection. Self-interest was entangled with concerns for family and kin. As such diaries capture their world view and the texture of early settlement life. Undergraduate students in my classes love the detective work associated with linking diarists to the census on ancestry.ca. They map diarists’ relationships and visiting patterns, count and table their agricultural production, and search for underlying narratives. A graduate student has applied Historical Geographic Information System to diary entries to analyze farmers’ economic and social networks. I have been using them to understand the internal dynamics of neighbourhood labour exchanges, especially barn raising, logging and quilting bees. We hope that you enjoy visiting the website. My distant cousins in Australia and Seattle and I, who have never met in person, are currently transcribing our great, great grandmother’s diaries online. The possibilities are endless and exciting. Catharine Wilson holds the Francis and Ruth Redelmeier Professorship in Rural History at the University of Guelph and is Founder and Director of the Rural Diary Archive. The website is funded by the Redelmeier Professorship and supported by the McLaughlin Library. For more regarding her publications or rural history at the University of Guelph visit these websites. If you know of diaries that need a safe home, contact the Rural Diary Archive. “Reciprocal Work Bees and the Meaning of Neighbourhood,” Canadian Historical Review, 82:3 (September 2001): 431-464. This article won the Canadian Historical Review Prize for the Best Article 2001 and has been reprinted in six anthologies. It is the pilot study for my current research on “Being Neighbours” which has been funded by the Social Science and Humanities Research Council of Canada. 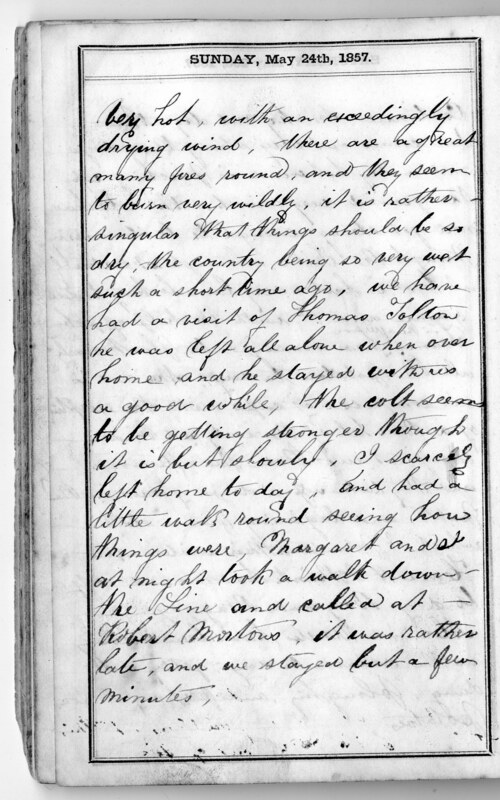 Image: Diary of Hannah Owen Peters Jarvis, Willowbank, 1845 Archival and Special Collections, University of Guelph. Provided by Catharine Wilson.